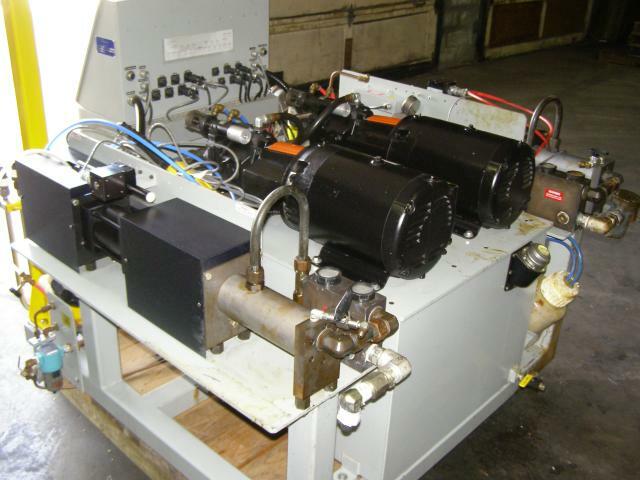 1990’ Delta Rim #40 SN#YM0122.is a high Pressure Metering Machine for dispensing 2 component reactive chemical systems at high pressure. This model machine is designed to have the capability to mold filler systems, non-corrosive material up to 5,000 centipoises. The unit is offered AS IS, Where IS. It is in extremely nice condition, clean and is reported to have low hours on the machine. It was removed from a lab environment. All documentation is on hand. The unit is as clean as they get. With external access for easy maintenance). Driven by dual Baldor 7.5 HP motors. Painted with chemical resistant paint. 4 gallon-jacketed tanks with lids rated at 115 PSIG for use in lab. Pneumatic driven agitator for one of the 4-gallon tanks. For continuous monitoring of dispense parameters. One touch control for smooth vertical travel of mix head in vertical position by 36”. Or range of 17” to 53” off of floor. Rim Pack 10 HP, 7.5 kw motor – 80-gallon reservoir. Low Pressure Re-circulation: maintains temperature and stable viscosities. Mounted on HP lines of both components, adjustable parameters. High-pressure limits will shut down machine if parameters exceeded. Closed loop oilier and condensate trap. to the shaft seal area of the ISO metering pump. Prevents chemical depletion and possible cavitation of metering pumps. High Flow Basket Filter mounted between Raw material tanks and the metering pumps. Both equipped with sediment drain. Unit controls chemical component temperatures, employing heat exchange circuits and on and off heating for both streams. Machine was originally manufactured to enable them to have this option. Ross ME401 - In Line Mixer / emulsifier- this unit was not part of the original purchase package from Gusmer, but was added later. I am unsure of what the application or function of the unit is, but I theorize it may have been used to nucleate one of the components. It may have also been the conduit of how they were deploying a filler to the system. Additional mix head was purchased separately for $13,500. It appears to be in like new condition. Additional plunger rod included with various other gaskets and seals to rebuild pump. Terms. 1/2 down with P.O. (Non-refundable) Cash in advance, certified check, money order or wire transfer with order, balance due within 30 days of initial payment, or buyer forfeits initial ½ down. Any Balance due 3 days prior to shipping if before 30-day period. Removal: Items must be removed within 30 days from receipt of initial 1/2 down.